In our previous Weekly note, we had mentioned about Markets modestly breaching the 27-month long upward rising channel. Though the lead oscillators were pointing towards being oversold, the level of 10040 remained important all through the previous week. In the week that had just 3-trading sessions, the Markets ended on a positive note. The benchmark Index, NIFTY50, ended the week with net gains of 115.65 points or 1.16% on weekly basis. 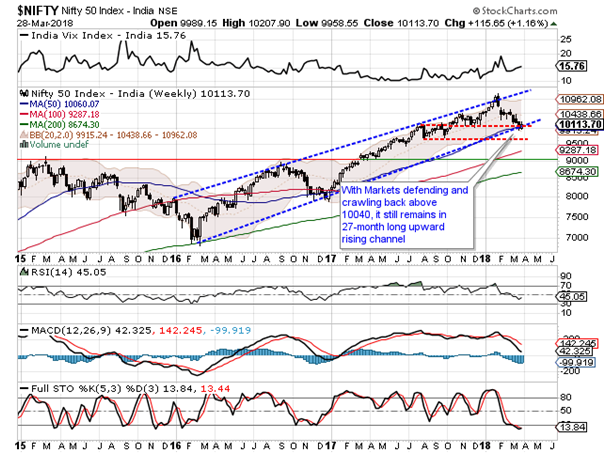 One of the most important factors to take note of is that the NIFTY has managed to defend and crawl back above the critical 10040-mark and therefore the 24-month long upward rising channel remains intact. 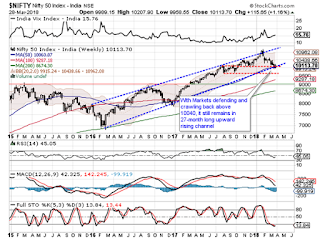 As we approach the coming week, we expect a positive start to the week and we expect the NIFTY to open and move past 200-Day Moving Average which stands at 10180. Going ahead all through the coming week, it would be crucial to see if the NIFTY manages to end above 200-DMA. The Relative Strength Index – RSI on the Weekly Chart is 45.0478 and it remains neutral showing no divergence against the price. The Weekly MACD is bearish and it trades below its signal line. No major pattern was observed on Candles. While having a look at pattern analysis, NIFTY has defended and has managed to crawl back above the 10040-mark. This level was crucial and with this level being defended as of now, the 27-month long upward rising channel remains intact. Next week’s strongly opening is nearly ensured by the global markets which have ended on the strong note. However, it may be extremely important to see that despite a very likely strong start which will see NIFTY above the 200-DMA mark in all likelihood, the sustenance above this level and closing above this level by NIFTY will be important. Also, the NIFTY remains oversold on Stochastic on Weekly Charts and overall we see the downsides being very limited. In any case, defending 10040-mark will be crucial not only in next week but in coming days as well. Overall, we expect positive undertone to dominate and we advice maintaining positive outlook through the week ahead. 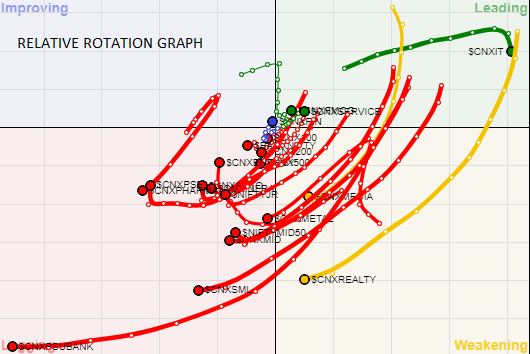 A study of Relative Rotation Graphs – RRG this week though majority of the sectors are still seen mildly losing relative momentum and ratio, many key sectors are seen improving their relative momentum against the Markets and are attempting for major stability. The coming week will still see relative outperformance from Services, Financial Services, FMCG and IT pack. Other key sectors like INFRA, AUTO, Midcap 50, NIFTY NEXT 50 and ENERGY are seen improving their relative momentum. Therefore, these packs may see select out-performance by their components. Apart from this, we do not expect any major moves on Weekly basis from PHARMA, PSU BANKS, BANKNIFTY, and Small Cap universe.